Isolated Secret Buddhist land at the trans-Himalaya zone, Tsum valley offers an exotic trek through the nature. Tsum valley is one of the restricted areas in Nepal. It was opened for travelers since 2008 only. People in this valley look like Tibetan because their ancestors were from Tibet. This trek is still less crowded area. 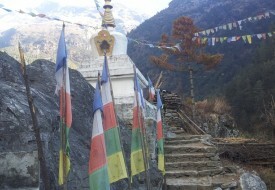 Tsum valley lies in north of Manaslu trek. The trail is off-beaten path trail. People here still practice polyandry due to anthropological reason of protecting handful of agricultural land from getting divided among brothers. All the brothers married with a single girl. Tsum valley is completely different from anywhere else. You can drive up to Arughat Bazar from where your trek begins along the Budigandaki valley. Dense alpine forest, terrace fields and ancient Buddhist monasteries are the special features of this trek. On the way you can enjoy with great view of Mt. Ganesh Range, Boudha mountain Range and Manaslu Range, Gorkha mountain range and Liding and Philim.